Water flows from three tiers in this lighted floor fountain that can be used indoors or out. This exceptional fountain design blends old and new, combining an antiqued faux stone finish with distinctively modern angles. Soft lights illuminate the water and the structure. 33" high x 16 3/4" wide and deep. 3-foot cord. Six integrated .6 watt LEDs (3.6 watts total). Light output 30 lumens; comparable to a 5 watt incandescent bulb. With 3 tiers of water. With a light on the three lower levels. How do you clean the bottom basin? BEST ANSWER: If needed, you can siphon out the water and clean with a soft towel. Lights not working, how to replace or troubleshoot? BEST ANSWER: Hi - the base measures approximately 16 3/4" square. Are the water spouts copper? If not, what are they made of? BEST ANSWER: Per the manufacturer, the fountain body is completely made of polyresin material including the spouts. Will the paint wear off? This is designed to be outdoors and has a very durable finish to withstand the outdoor elements. Can you adjust the flow of water so that it does not splash? BEST ANSWER: Hi, the pump has a small adjuster knob to lower the water level. BEST ANSWER: This weighs 32 pounds. How much water does it hold? Can it run on a timer? BEST ANSWER: Hi, the fountain holds about 4 gallons. It can be connected to a timer. I would say 5 gallons. You can plug it into a timer. If used indoors, how much splash out is there? BEST ANSWER: Due to the cascading effect, the water fountain will splash water. The splash out of my unit is very little. You should be fine indoors. We need to cut out a small vertical section (12" high x 3" wide) on the back of the fountain in order to accommodate a small pipe that extends from our wall. We can reinforce the area around the section we remove, but is the material that the fountain is made of be a type that can be cut and is there room in the rear of the fountain to for the pipe to extend into it 1-2")? We would appreciation suggestions or help you might have. Thank you! BEST ANSWER: Hi! Thank you for your question. It sounds like you have a unique application. As you can imagine, this question is somewhat difficult to answer. We have not tested fountain durability if a section is cut out of the fountain. The fountain is made of resin which could be patched by a person who knows how to do that and has the right tools. You many need to consult a professional in your area and see what they recommend. Please note that any alterations to the fountain will void the manufacturer's warranty. We are not saying it can't be done however, we cannot make any recommendations regarding altering our fountains. BEST ANSWER: The electrical cord is 3 feet long. BEST ANSWER: This design is electric powered. How many gallons of water does it hold? BEST ANSWER: I would say 3 to 5 gallons. BEST ANSWER: This fountain runs very quiet, and all you hear is water running down from chamber to chamber. If you have a lot of road noise, it will not block that out. I bought this water fountain to hear the water flow. It won't drown out the traffic ( I dont think anything will) but I believe you will definitely hear it. You can adjust the water flow to help make it louder. 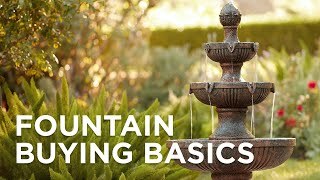 This is an attractive fountain and easy to put together. Pros. The light kit adds a very attractive look. Cons. The pump is too powerful causing water to splash everywhere. The water reservoir is in the base and hard to clean. This waterfall is for real. It was delivered on time, and arrived undamaged. I really enjoy the fountain and the peaceful sound of the water. It's beautiful lit up at night. I put a plantar with grasses on each side of the fountain which looks great! Would recommend this product to a friend. Add the charm of childhood to a garden or porch area with this darling fountain featuring a boy and girl holding an umbrella. Two dancers embrace in this modern indoor/outdoor fountain that includes an LED light for illumination during the night. This classic water well tabletop fountain features a sweet scene from childhood. Provide soothing background noise and a calming aesthetic with this traditional indoor-outdoor three-tier fountain.